A little while back I wrote about how it can be challenging to work on projects with all the interruptions of life. One of my favorite projects/crafts is quilting. I love putting fabric and print together to form design. 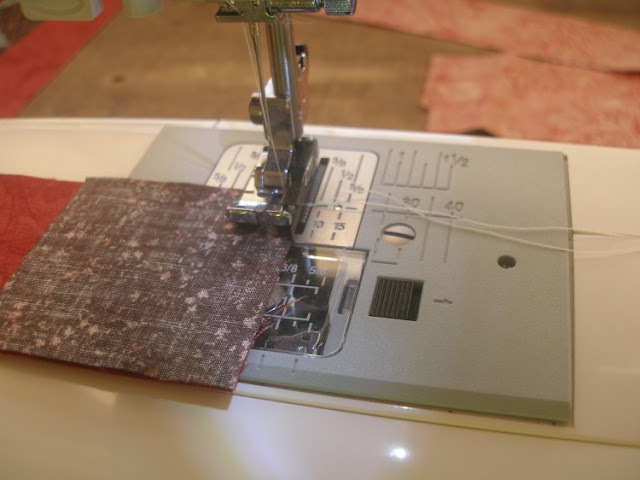 I love the methodical stitching, watching faint lines form and fabric puff ever so slightly. 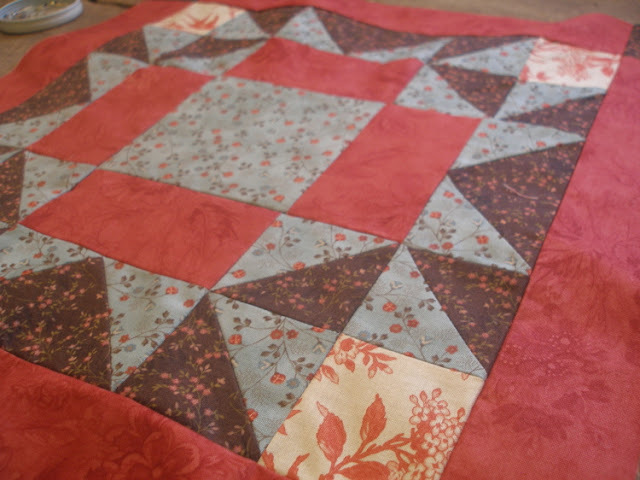 It really does pain me to imagine that it will be a long time until I'm able to make a full-size quilt again. It pained me, too, when I really wanted to make a quilt for my best friend and her groom but knew I didn't have the time. My mom came through with the simplest of ideas and it was as if the heavens opened up and the angels began to sing. I could quilt. I could finish pieces. I could do it! And so I did. 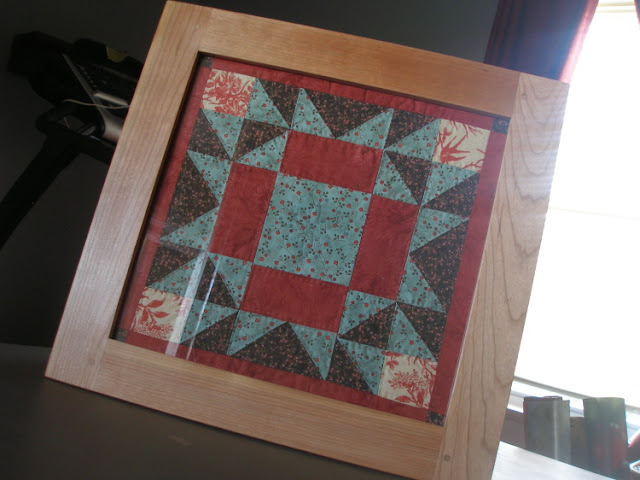 This past fall, I made three quilt squares and framed them with Jamey's help. He made the frames and some of the glass even came from our old windows. All the fabric was leftover from previous quilts. I love it when projects come together (and don't take years to complete). The project was quite simple. I pieced the top and used thin batting (to sandwich between) and leftover (less-than-lovely) fabric for the back (which no one will ever see). I quilted the square, then wrapped it over a piece of sturdy cardboard, taping the edges to the back of the cardboard with masking tape. Jamey hammered in flat little brackets to keep the cardboard-covered square in place, then we covered the back with brown paper, gluing the edges to the back edges of the frame with rubber cement glue and attached a picture frame hanger. We chose not to use spacers to keep the quilt off the glass. Some feel this is important. We did not. Don't give up. Find a manageable way to keep doing the things you love. Let's not completely extinguish the talent and joy God gave us. It doesn't have to be all or nothing. "Sewing kits provide basic tools to make and mend clothing. These tools will be used often and must be of good quality. People in such countries as Bosnia, Haiti, Liberia, Nicaragua, Russia, Serbia and Ukraine receive sewing kits from Mennonite Central Committee." Go here to learn what's needed in each kit and where you can drop off or send the contents. Beautiful! What a lovely gift! "Don't give up. Find a manageable way to keep doing the things you love. Let's not completely extinguish the talent and joy God gave us. It doesn't have to be all or nothing." There is so much wisdom in this!! So often I feel like it has to be all or nothing and all I really need to do is sit down and think of a good compromise. Thank you so much!!! Absolutely beautiful work. It is really one of my desires to learn to sew, but it takes me forever just to sew a button on. Maybe one day I will take the time and take a class. I think it would be so rewarding to be able to make something like you have made and to know that it came from my own two hands. Your quilt blocks are lovely and what a good idea to frame them as pictures! 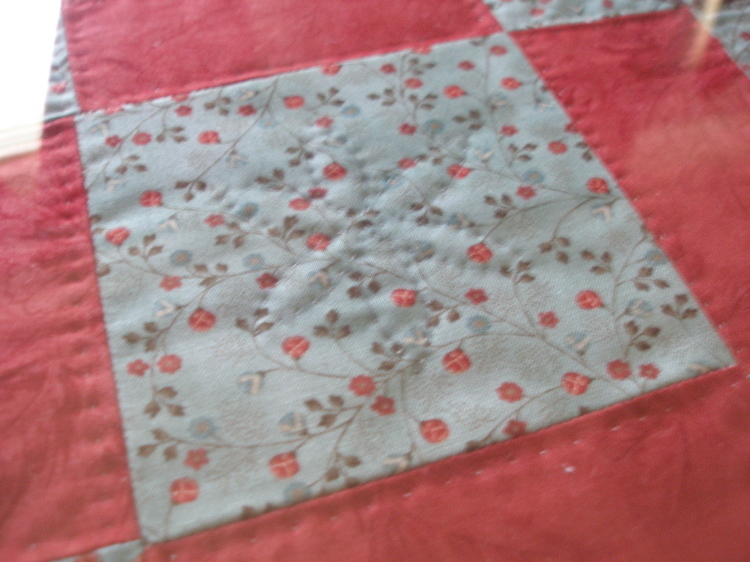 I love little pieces of quilting like that . . . I like to use small "wall hangings" throughout my house for decorations. What a great gift idea! My dd's (15 & 12), my ds (16), and I love to quilt together. The girls are working on quilt projects for a 4H competition right now and I'm itching to get a quilt project going for myself. I've been organizing scraps by color to see if I have enough to make something. This post gives me the idea of making a small quilt the size of your framed block for a wall hanging for a child's room. 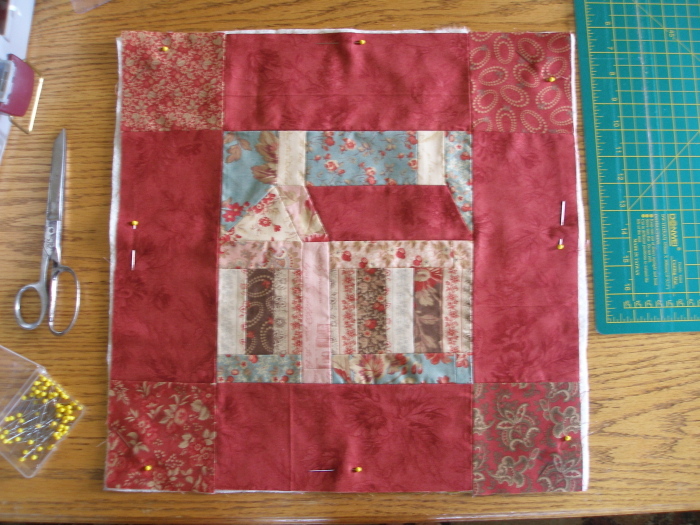 I may do this if I don't have enough scraps to do a larger quilt. Thanks! Such lovely blocks! I enjoy making quilts, but usually in the modern style as some of the traditional blocks intmidate me. Seeing your projects just made me realize that I can break it down and suddenly it doesn't seem s overwhelming. Thanks! Very pretty! Good for you on getting it done. these are so pretty and would look so beautiful on your friends wall. What a lovely way to continue the craft that you love. Such a wonderful idea. Beautiful. Where there is a will there is way. Lovely! 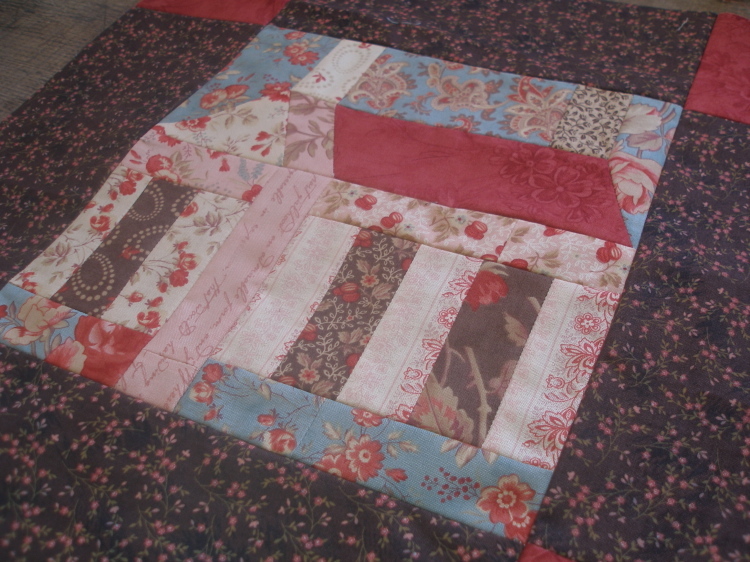 I love to make hotpads, like little quilts - and useful too! I love these! I seldom have the inclination to finish a full size quilt, but I think I would enjoy making these. It's going to be beautiful! Enjoy your Sunday and sewing! Can you name the items that you use to sew? Thx! !